U.S. census data indicates that approximately 20 percent of Floridians are over the age of 65. While everyone experiences the same accidents and mishaps to a degree, there are certain situations that are statistically more likely to affect seniors. However, very often, no lawsuit is brought, either because it is seen as a waste of time or because the injured party does not know how to begin. If you are familiar with some of the common causes of action likely to disproportionately affect the elderly, you may be able to bring the appropriate suit to recover compensation. By far, the most common injuries sustained by elderly people are related to falls, either at home or in public places. Approximately one-third of those over age 65 report falling at least once per year, and many of those falls yielded injury severe enough to require a visit to the doctor or emergency room. However, many elderly people do not discuss falls with their doctor, partly out of a fear that their autonomy may be restricted if they disclose the mishap. Transparency is vital, especially if you are attempting to bring suit to allege that someone else’s negligence is partly responsible for your fall. If you do not disclose a history of falls, or do not tell the truth to your doctor so that they can speak as to your medical history, you may not be able to recover because your obfuscation of facts can impugn your character. Fall injuries can also manifest in multiple ways – that is, not every fall will lead to the same broken bones, or indeed, any broken bones. The most common fall injuries tend to repeat themselves, however – broken wrists and fingers from trying to catch oneself, broken hips if the fall is on the relevant axis, cracked vertebrae or head trauma from particularly uncontrolled accidents, and so on. Just because your injuries do not mirror those of another fall’s does not mean that you will not be believed. Negligence is the issue at hand, not health, coordination, or lack thereof. While obviously, automobile accidents can be fatal for anyone involved, the percentage is distinctly higher for elderly drivers or passengers. While fewer people tend to keep their driver’s licenses as they age, the rate of fatal accident for drivers over the age of 70 has noticeably increased, and continues to do so through the 85+ bracket. Elderly pedestrians are also at higher risk than those of younger years, simply because accident trauma may be poorly handled by an elderly person’s body compared to that of a young person. Be advised that if you are involved in an accident as either a driver or a passenger, and the plaintiff is elderly, you may be subject to the rule referred to at common law as the “eggshell plaintiff rule.” It is very common for elderly people to suffer harm beyond what an average person might experience if they are in an accident, due to their somewhat more precarious state of health. Sometimes a defendant will try to argue that since the person’s health was unusually precarious, that they should not be liable for all the plaintiff’s injuries because they were unforeseeable (and unforeseeable events are not compensable). The eggshell plaintiff rule holds that the defendant must take their plaintiff “as they find them,” meaning that their health is irrelevant for the purpose of damage calculation. 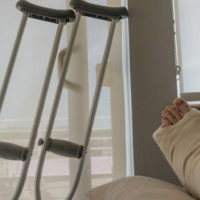 Whatever injuries the plaintiff sustains are compensable, if the defendant is found to be liable. Elderly Floridians might have to take extra care with their health, but this does not mean that they are not entitled to seek redress if they are injured due to someone else’s negligence. If you have been victimized, contacting a knowledgeable attorney can help. The Winter Park personal injury lawyers at the Hornsby Law Group can help answer your questions and suggest how best to proceed from here. Call us today to set up an appointment.